“Em, mua gì?” is what I hear in every shopping experience. “You, buy what?” is the literal translation, of course it’s usually in a polite manner. Saigon is a city full of sales people. I noticed this when we made our first trip here. Everyone is always trying to sell something, no matter where you go. Of course you’ll find salespeople in the markets and stores and even on the streets, not only the streets where backpackers reside, but also every street in the city! Shopping in the markets can be such a great experience, but also a very overwhelming experience. 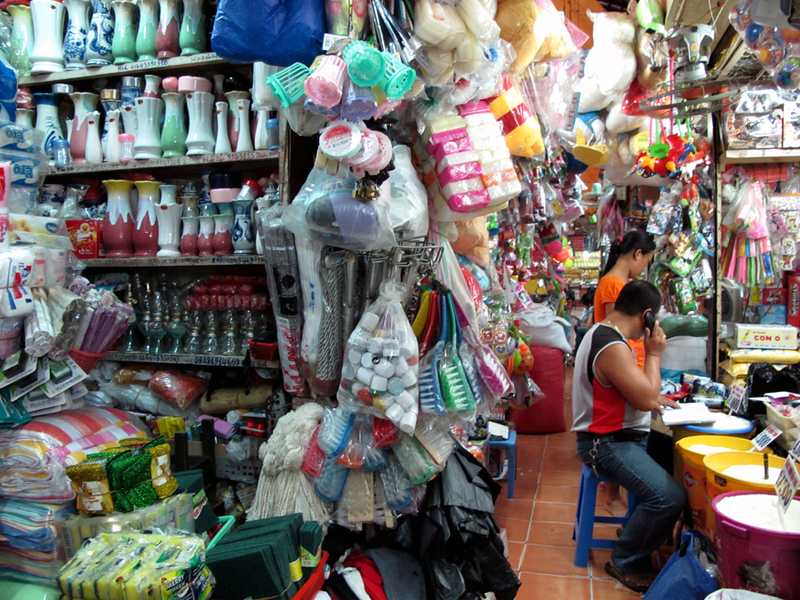 If you like to bargain, Saigon is the place to go shopping. I hated bargaining at first. I just wanted to get what I wanted and leave. However, if I continued to do that, I would be spending three times the actual price. Randy has helped me become a better negotiator. He’s always looking for the cheapest, high quality things. And he always gets the lowest price even as a foreigner. Shopping is actually kind of fun now, because I am able to bargain without feeling bad and I can speak some Vietnamese. Now, that I’m more knowledgeable about the prices and how things work here, I’m a much better shopper, although I still sometimes give in when I should just walk away. Every market has similar things. But some markets are more specialized in what they sell. There are dozens of markets in this city. But choosing which one to go to depends on what you want to buy. For example, if you want to buy fabric, Tan Dinh Market on Hai Ba Trung is the place to go. Or if you want clothes and some souvenirs, An Dong Market has everything in bulk. Nevertheless, each market has similar items. Everything is so jam packed sometimes it’s hard to find what you need. Fabric makes up a good part of any market. They also sell everything from vegetables, meat, fish, seafood, clothing, jewelry, dishes, kitchenware and everyday items like shampoo, soap and bath scrubs. Markets are the best place to get fresh fruit and vegetables at a cheap price. However, people sell these things on the streets as well. Every morning around 9:00, a man screams something like “HIDEAWAY!” That’s definitely not what he’s saying, but it sure sounds like it. When I look outside, it’s a man on a bicycle pushing a big cart of bananas. A bunch of long bananas are about $0.50 USD. Yes, people carry fruits and vegetables on bicycles around every street. We buy watermelons that weigh about 2 kilograms (4.4 pounds) for about $1.75 USD. People sell everything on these vehicles called “xe ba gát.” They not only sell fruits and vegetables, but also cleaning supplies like brooms, dusters and snacks (like banh trang tron). You’ll also see people walking around selling things that you would find in a convenient stores like tissues, fans, nail clippers, cigarettes and more. These salespeople are found more likely in the tourist part of town, although I’ve seen them in my neighborhood as well. Another really great shopping experience for clothing is not going to the huge shopping malls – or more like department stores like Diamond Plaza, the Parkson or Vincom Center – it’s riding your motorbike and shopping on the streets at night! It seems a little bit lazy because you could just walk up and down the streets and it’s a little inconvenient to have to drag the motorbike with you to each shop. But, it’s the best, because you don’t have to stop at every place and the streets that have this type of night shopping are really long, so if you walked, it could take hours and hours! From about 8pm to 12am, people set up shop on the sidewalks of Saigon’s streets. You can find anything from men and women’s clothing, bags (knock-off bags), flip flops, wallets, socks, jeans and more. 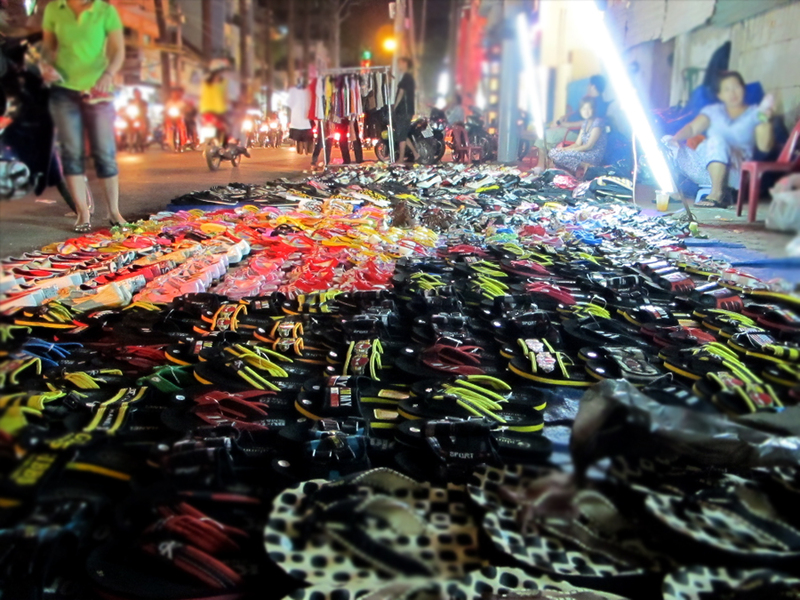 Two pairs of flip flops go for 16,000 VND ($0.80 USD). I’m not quite sure why and how these items are so cheap. There must be something wrong with them, but they should last for a few wears. Everything in Vietnam can be haggled, except for things in stores where they are at a “fixed price” or are already discounted – which is what they all say. Shopping in Saigon can be distressful, but it can also be reassuring when you know that you got the right price for something.